Lori Loughlin and Mossimo Giannulli (yes, the Target Mossimo) have laid low for most of their marriage, but that changed in March 2019. The pair, who rarely grace the red carpet together, was thrust into the spotlight over its alleged involvement in a massive, multi-million college admissions scandal. According to CNN, the famous couple was accused of paying $500,000 in bribes to help get their daughters into the University of Southern California as recruits for the crew team when neither girl actually competed in the sport. Though these two have now been painted as the figurative Bonnie and Clyde of helicopter parents, their love story is fairy-tale sweet. From love at first sight to slapping on sweatpants and saying "I do," there's a reason this couple's marriage has transcended decades (an actual eternity in Hollywood). Here are some strange (but adorable) things about Loughlin's marriage to the fashion mogul. A wedding dress is pretty much the central part of any celebrity wedding. Kim Kardashian's gown landed her in Vogue, but Lori Loughlin's nuptials were far more low key — even outside of Hollywood standards. According to The Hollywood Reporter, the Full House star tied the knot with Mossimo Giannulli in 1997 wearing sweatpants and ski hats. Not the look you'd expect from a fashion mogul and his bride-to-be. In an interview with Entertainment Tonight, Loughlin revealed that she eloped with her hubs on Thanksgiving day at sunrise (which means they still probably had time to watch the parade post-ceremony). The guest list consisted of Moss' best friend and a minister, and rather than a reception, they headed off to Thanksgiving dinner, where they shared the news with their loved ones. "Moss and I had both been married before, so we thought, 'Well, it didn't really work out well for us the first time around, so maybe we'll elope and see how it goes and tell people,'" Loughlin told Entertainment Tonight. "We had talked about doing a wedding and we just thought, 'Let's get up and let's go do it.'" You can bet that Lori Loughlin and Mossimo Giannulli dove into that leftover piece of frozen wedding cake a little prematurely. In an interview with Entertainment Tonight, Loughlin revealed that they celebrated their anniversary on the wrong day for 20 years! What happened? They were going off their marriage license, which said Nov. 25, 1997. However, their actual nuptials were two days later. Loughlin told Entertainment Tonight that she only came to the realization that she was celebrating her anniversary on the wrong day after having dinner with actresses Candace Cameron Bure and Marilu Henner. According to ABC News, Henner is one of 12 people diagnosed with hyperthymesia, a memory condition that allows her to "remember specific details from almost every day of her life." She reportedly told Loughlin, who was reminiscing about her Turkey Day elopement, that Nov. 25, 1997 was a Tuesday and could not possibly have been their wedding date. "I called my husband, and I'm like, 'Oh my goodness, we have been celebrating two days early!'" Loughlin told Entertainment Tonight. "So it's actually Nov. 27, 1997 … I think we're going to make [our anniversary] a three-day festival now." There was never any real romance on-set between Full House co-stars John Stamos and Lori Loughlin. Aunt Becky and Uncle Jesse saved it for the cameras, but the stars did go on one date. In an interview with HuffPost Live (via Us Weekly), Stamos revealed that they hit up Disneyland together when they were teenagers. "We did have some off timing, but no disrespect to her family and her husband now, I would say that she could be the one that got away." Loughlin was married to Lionsgate executive Michael R. Burns during her time on Full House. When they divorced in 1996, Stamos had met actress Rebecca Romijn, who he later married. By the time Stamos and Romijn got divorced, Loughlin was with Giannulli. Stamos said Loughlin is "one of my dearest friends, and that's good enough." So there you have it: Fans will just have to relish Aunt Becky and Uncle Jesse's lengthy small-screen union, though even that relationship is up in the air now that Loughlin has been cut from the Fuller House reboot, reported Screen Rant. The romantic in all of us wants to believe in love at first sight. When you know, you know, right? That's what the stories always say. As it turns out, Loughlin's marriage to Giannulli is indeed the stuff of fairy tales. In an interview with Closer Weekly, Loughlin admitted that she always had a different feeling about the Mossimo clothing mogul. According to The Hollywood Reporter, the pair reportedly met in a restaurant in Los Angeles. It was pretty much love at first sight from there. Though they eloped after two years of dating, he was Loughlin's end game from day one. "I just knew when I met Moss that he was my guy," she told Closer Weekly. "I don't know how to explain that — I just knew it was something different than with anybody else I've ever met." Though it might have been love at first sight for Lori Loughlin and Mossimo Giannulli, they were both married to other people before they met. Loughlin wed studio executive Michael B. Burns in 1989 during Full House's heydey. The pair divorced in 1996 before the show came to a close, and she married Giannulli the following year. According to an interview with Closer Weekly, there's no obvious reason Loughlin's first marriage didn't work out. She just had a gut feeling and went with it. "He was a great human being, but I just felt he wasn't the one for me," she said. "I was probably too young and didn't know enough about what I needed, but I couldn't say one bad thing about him. He was a really nice person." According to The Hollywood Reporter, Giannulli has a son, Gianni Gene Giannulli, from his previous marriage who became the owner of a pastry business called The Smart Co.
Aunt Becky and Uncle Jesse never worked out in real life, but we can't stop hoping — and neither can Lori Loughlin's real-life husband. Mossimo Giannulli has a habit of dropping into Loughlin's social media comments section to publicly 'ship his longtime love for TV's dreamiest uncle. In an interview with Entertainment Tonight, Loughlin revealed that she gets an onslaught of comments about Uncle Jesse every time she posts something about Giannulli (though she has since deleted all of her accounts, according to CBS News). The general gist is that her fans want her to marry Stamos, who tied the knot with actress Caitlin McHugh in 2018. Though Loughlin and her hubs laugh it off, he occasionally feels the need to chime in. "What's even funnier though, is sometimes my husband will comment back and say, 'Yeah, you should have [married Stamos]!' or something funny like that. Like, he'll just pop off," Loughlin told Entertainment Tonight. A couple that (allegedly) commits crimes together also spends exorbitant amounts of money to bail themselves out together. 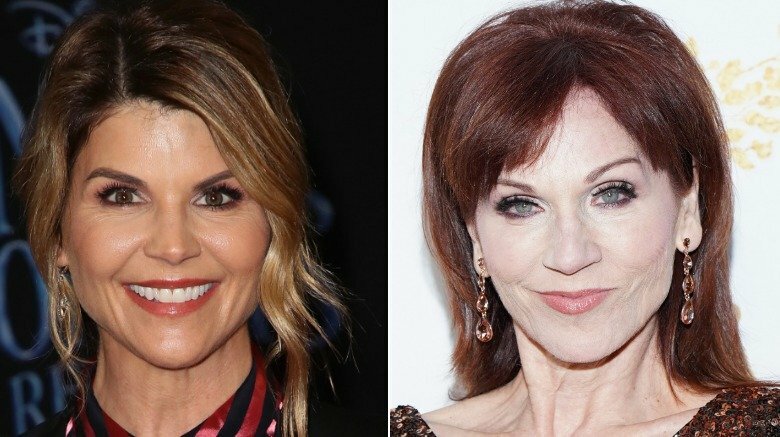 When Lori Loughlin and Mossimo Giannulli were charged with fraud for allegedly paying $500,000 in bribes to get their children into USC, they had to come up with $2 million in bail money, according to People. Thankfully, these two celebs had no problem paying up. Chalk it up to Giannulli's Mossimo fortune or Loughlin's Hallmark movies, but the pair used its $35 million mansion as "collateral," People reported. Their massive Bel-Air home has reportedly proved helpful in more ways than one. According to People, Mr. and Mrs. are "laying low" with their two kids, Olivia Jade and Isabella Rose. At least being stuck at home stings a little less when you've got six bedrooms, nine bathrooms, a large swimming pool, and something People describes as a "gold bar," which sounds rather luxe.